SOURCE: Patriot One Technologies, Inc.
TORONTO, ON--(Marketwired - Feb 22, 2017) - Patriot One Technologies, Inc. (TSX VENTURE: PAT) (OTCQB: PTOTF) (FRANKFURT: 0PL) ("Patriot One" or the "Company"), developer of a revolutionary concealed weapons detection system, is pleased to announce that its NForce CMR1000 software solution and related hardware, has completed internal quality assurance in preparation for a major trade exhibition in April. The hardware already carries the "CE Mark" which certifies that the product has met EU health, safety and environmental requirements that ensure consumer and workplace safety and allows manufacturers to circulate industrial products freely within the internal market of the EU. The system is now entering pre-certification testing for FCC compliance ahead of its product launch at ISC West (International Security Conference) in Las Vegas in April. The product has also been vetted as ready for inclusion in the prestigious New Product Showcase at that conference. Patriot One is now optimising its software to enhance performance characteristics and continues to collect additional weapons "signatures" for entry into the NForce proprietary database library. This is being achieved through an extensive law enforcement network which provides controlled access to weapons collections globally. The Company also advised today that it has now identified a manufacturer in the USA that has the capacity to meet the initial demand forecasts of its NForce CMR1000 production needs through 2018. "One of the most noticeable recent developments is a sleek new profile which will enable greater installation versatility in the field," notes Dinesh Kandanchatha, President and CTO of Patriot One Technologies Inc. In addition, Patriot One has recently developed valuable new IP regarding antenna design, which will result in the filing of additional patents further protecting its technological advantage in the marketplace. Along with the previously announced plans to launch a demonstration location in Orlando, Florida, Patriot One has initiated a test site at its new head office in Burlington, Ontario where it has begun ushering strategic groups through the facility demonstrating this ground breaking new technology. The presentation conclusively establishes the NForce CRM1000 software solution's ability to identify a weapon (threat) from a non-threat. The private tours include an in-depth look at the science behind the process and an introduction to its user-friendly interface which enables anyone to operate the system with ease; not just security personnel. An exciting new feature of the user interface is the ability to combine a simultaneous camera image of an individual as an alert is triggered. "Our engineering team have worked long and hard to take this lab proven technology and transform it into a commercial product. This is a momentous achievement in our corporate development," added Kandanchatha. "In preparation, our supply relationships are already being locked down, and we are satisfied that we have a robust design ready to meet both customer requirements and volume expectations." 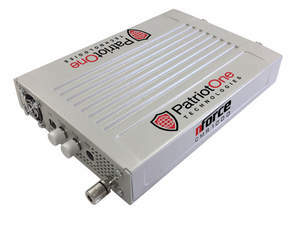 For more information on Patriot One, visit www.patriot1tech.com; product information described above can be found here. Patriot One has developed a first-of-its-kind Cognitive Microwave Radar concealed weapons detection system as an effective tool to combat active shooter threats before they occur. Designed for cost-effective deployment in weapon-restricted buildings and facilities, the NForce CMR1000 software solution and related hardware can be installed in hallways and doorways to covertly identify weapons and to alert security of an active threat entering the premises. Owner/operators of private and certain public facilities can now prominently post anti-weapons policies with compliance assured. The Company's motto Deter, Detect and Defend is based on the belief that widespread use of its technology will act as an effective deterrent, thereby diminishing the epidemic phenomena of active shooters across the globe. For more information, visit: www.patriot1tech.com. About this company Patriot One Technologies, Inc.
2017 NForce CMR1000 Weapons Detection hardware package enables installation versatility.